Monaco is known for its glitz, glamour and millionaire lifestyle and the Formula 1 race track here is probably the most iconic race track in the world. It was a circuit used in the very first modern F1 World Championship back in 1950 and has been staged there ever since without interruption since 1955. Despite several revisions, the track retains pretty much the same layout that it’s had since 1929. The last major change occurred in 2004 when a permanent pit area was built to replace the temporary complex that had previously been used and was far too cramped. The main challenge of the Monaco track is that it’s extremely twisty and difficult to manoeuvre at high speed. Some F1 drivers have likened it to trying ride a bicycle around your living room! Because the race takes place on normal city roads, it’s a shorter, narrower track that’s almost impossible to overtake on. Racing in such a tight space leaves no room for error and over the duration of the 78-lap race, a driver will change gears almost 5000 times! Five of the fourteen wins that Graham Hill achieved were done on the track at Monaco in the 1960s. More recently, Michael Schumacher grabbed 5 wins between 1994 and 2001. Alain Prost enjoyed victories here 4 times during the 1980s and the old legends Sterling Moss and Jackie Stewart each boasted 3 wins at the principality. Currently, Lewis Hamilton, Fernando Alonso and Sebastian Vettel have all racked up 2 wins at the Monaco Grand Prix. The race at Monaco holds the record for the least number of cars to finish a race. In 1966 and 1996, only 4 cars crossed the finish line. The oldest driver to start a Formula 1 race was a Monaco local, Louis Chiron. He competed in the 1955 race and was 55 years of age at the time. He achieved sixth place in his Lancia. 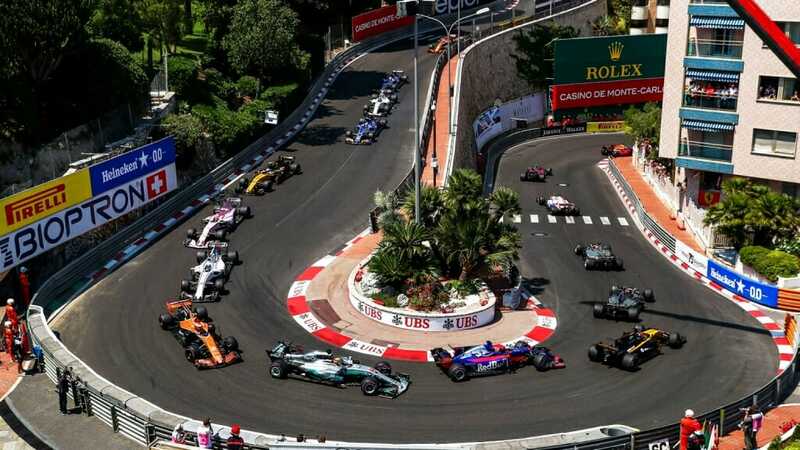 The race at Monaco is the only one on the F1 calendar that doesn’t have to pay an annual sanctioning fee to the Formula 1 owners. The track is the shortest F1 track at 3.34km and 16 turns. The race distance equals 260.5km or 78 laps. The fastest lap record is held by Michael Schumacher for Ferrari who completed a lap in 1.14 seconds in 2004.